Tara Sivec is a wife, mom, chauffeur, cheerleading coach, soccer coach, babysitter, short-order cook, genius and albino squirrel hunter. She lives in Ohio with her husband and two kids. 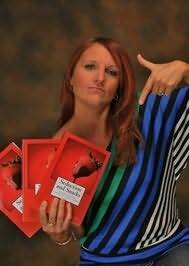 In her spare time she likes read, write and cover things in chocolate. Most of her material comes from real life experiences with family and friends. Lucky for them, the names have been changed to protect the innocent (aka, drunk).